Millions of Studs Terkel fans have come to know the prizewinning oral historian through his landmark books—“The Good War”, Hard Times, Working, Will the Circle Be Unbroken?, and many others. Few people realize, however, that much of Studs’s best work was not collected into these thematic volumes and has, in fact, never been published. P.S. brings together these significant and deeply enjoyable writings for the first time. The pieces in P.S. reflect Studs’s wide-ranging interests and travels, as well as his abiding connection to his hometown, Chicago. Here we have a fascinating conversation with James Baldwin, possibly Studs’s finest interview with an author; pieces on the colorful history and culture of Chicago; vivid portraits of Studs’s heroes and cohorts (including an insightful and still timely interview with songwriter Yip Harburg, known for his “Brother, Can You Spare a Dime”); and the transcript of Studs’s famous broadcast on the Depression, the very moving essence of what was to become Hard Times. A fitting postscript to a lifetime of listening, P.S. 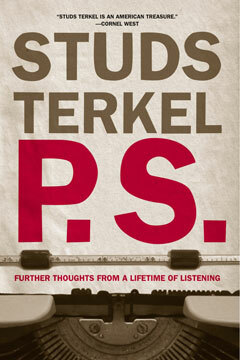 is a truly Terkelesque display of Studs’s extraordinary range of talent and the amazing people he found to talk to.